It’s been a good period for the housing market in the UK. This is according to the numerous HPI reports published by Rightmove, Halifax, Acadata, Nationwide and the Office of National Statistics. These House Price Index Reports record the average price of houses in the UK as well as the % change year on year and month on month, giving a good overview of the current state of the market. Rightmove’s report puts the UK’s average house price up 0.7% in September from August – almost a full percentage point. This matches the average September change from 2011 onwards. The average selling price has also increased, which is great news for current homeowners. Halifax’s report also saw average house prices rise 3.7% during the quarter ending in August (Q3) compared to the previous quarter. This follows a continuing trend of quarterly rises. The monthly rise in the same report is somewhat more subdued at just 0.1% from August to September. However, it is the fourth month in a row that the average price has risen, now standing at £229,958. Acadata also showed a small but positive 0.1% increase in month on month prices, whilst annual change has remained steady at 1.8% for the 3rd consecutive month. All regions in the country have also recorded record annual price rises. Nationwide had one of the most interesting reports of the month, with a 2% rise on the same period last year, and a 0.7% rise over the last quarter. These were at odds with the monthly change, showing a -0.5% change in prices. The Office of National Statistics has recorded no significant change in their month on month figures, but a 3.0% annual change from last year. This figure would be higher but for the slowdown in London’s property market, which has somewhat skewed results. When broken down by regions, northern areas and the midlands are still outperforming the capital, and the UK average. 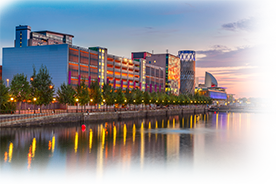 We currently have several deals located in Manchester, as well as other northern cities such as Leeds and Liverpool, which are tenanted, furnished and income generating from day one. If you’re on the search for your next property investment, give us a call today on 0800 011 2277.